ThinkSTEAM: Can you tell us little bit about yourself, where you grew up, your background, who is your role model? Shree Bose: I was born in Santa Rosa, California to two hard-working immigrants from India who had traveled to the United States to create a better life for themselves and for their kids. My older brother, Pinaki Bose, is two years older than me and was one of the main people I credit with my early love of science. My family moved to Fort Worth, Texas when I was 5 years old for dad to start his own metallurgical company, and it’s really his entrepreneurial spirit and passion for following his dreams that makes him my role model in all I do. Inspired by my grandfather’s passing away due to cancer, I got involved in cancer research at the age of 15 years old which won me the grand prize at the inaugural Google Global Science Fair in 2011. I am currently a senior at Harvard University, majoring in Molecular and Cellular Biology and doing my minor in Global Health and Health Policy. I am cofounder of Piper, a startup based out of San Francisco developing electronics kits to get kids building with technology while playing Minecraft, and I’m interested in pursuing an M.D.-Ph.D. in the future. Shree Bose: I remember some of my earliest experiences with science really being influenced by my incredible older brother, Pinaki. Two years older than me, my brother was always the kind of student who would learn exciting things in class and then come back and explain them to me. One of my earliest memories is Pinaki explaining atoms to me and how these tiny building blocks could make up the entire world, and I remember the way his eyes lit up with excitement. That passion, that wonder, and that amazement in the way science can explain the world is something I credit to my brother and something I hope to never lose. ThinkSTEAM: Can you briefly describe your research in drug-resistance and chemotherapy that caused you to win the Google science fair? Shree Bose: In short, my work for the Google Science Fair focused on a particularly chemotherapy drug called cisplatin, which is a platinum-based compound responsible for causing cancerous cells to commit programmed cellular suicide. This drug, which is very commonly used to treat ovarian cancer, often has high recurrence rates – meaning that patients who are declared cancer free often return within 5 years with ovarian cancer again which is now resistant to the drug. In order to figure out what was happening in the cells to make them resistant, I focused on the energy protein, AMP kinase (a central metabolic regulator), and through a series of experiments, I was able to show that this protein and its involved pathways seem to be involved in how cancer cells stop responding to cisplatin. There is much more left to be discovered from a research standpoint, but it also suggests that patients with recurrent disease might be more effectively treated with a combination of an AMPK inhibitor and cisplatin. More information can be found on my project site. ThinkSTEAM: What inspired your research in cancer? Shree Bose: My grandfather was one of the most organized, put together people I have ever known. In my grandparents’ home in Kolkata, India, he had years and years of Reader’s Digest Magazines all sorted away chronologically in big dusty file cabinets, and he could always find any family photo in his perfectly labeled albums. But that put together man wasn’t the one I saw when we made the trip to India after he was diagnosed with liver cancer. My grandfather was bedridden, unable to get up or shave or even clip his own toenails. Seeing that sort of dramatic decline, and ultimately his passing, was what inspired me to start cancer research at the age of 15 years old. I want to be able to help patients like my grandfather in the future, and hopefully I will be able to create a career that does precisely that. ThinkSTEAM: How did it feel to win the Google Science Fair? Tell us your experience. 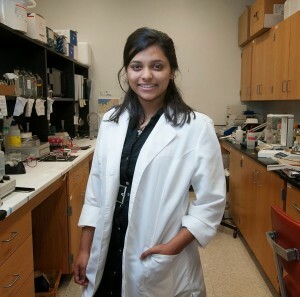 Shree Bose: Winning the Google Science Fair in 2011 was absolutely a whirlwind experience and such a dream come true. I remember standing in on the stage at Google HQ in Mountain View being handed this amazing Lego trophy, and just being shocked and incredibly honored to be recognized in such a huge way. Right after, I just had a string of really incredible opportunities like getting to present to President Obama and NIH directors, and showcase my work around the world, and I found a passion in being able to speak to and mentor so many other students out there who were excited about science as well. I have been incredibly fortunate to have the sort of global platform that the Google Science Fair has given me, and I hope I have been able to use it in a way that inspires and excites other future scientists. Shree Bose: Science is definitely an endeavor which is fraught with obstacles – from experiments not working to having to rethink the questions you are trying to answer. For me, I think one of my biggest obstacles was actually getting started in research in the first place. As a 15 year old who was passionate and excited about working with cancer research, I was young and, some might say, naively optimistic about the realities of research. I started off by emailing professors in my area working with cancer, and I received dozens and dozens of rejections. I remember just receiving these rejections, almost shrugging it off, and continuing on to email the next professor on my list. I think that earliest experience really shaped how I approached the experiments and work I later went on to do, in that I always felt fortunate. No matter whether my experiments weren’t working, at least I was in a lab doing amazing things that could make a difference and that was a great thing. ThinkSTEAM: What was your reaction to meeting President Obama and having him talk about you in his speech? Shree Bose: Meeting President Obama was definitely one of the most incredible highlights of everything I have gotten to do so far. I along with the two age category winners from the 2011 Google Science Fair were invited to the White House and in I think I received an email the day after President Obama’s speech with a link to the video, and I just sat in absolute shock for a few minutes because I was just blown away. Honestly, what I remember is feeling really amazed that one of the most powerful leaders in the world would take the time to honor students interested in science and, in doing so, show the rest of the country how important getting students excited and involved in STEM actually is. ThinkSTEAM: How did it feel to receive Glamour Magazine’s 21 Amazing Young Women Award? Shree Bose: My first response to receiving the Glamour Magazine’s 21 Amazing Young Women Award was really surprise, because I had never particularly thought of myself as glamorous in any way. But it was so incredible to see a huge brand like Glamour which is targeted at popular culture and women honoring someone in STEM, and taking steps towards making girls in STEM glamorous. As one of Glamour Magazine’s Top 10 College Women of the 2015, I was actually featured in the magazine alongside 9 other really amazing young women who are changing the world, and it was amazing to think that a young girl might pick up the magazine and realize that being in science or entrepreneurship or using her unique skills to do something amazing could be in a fashion magazine. I have to thank Glamour for that sort of platform, but also for redefining what it means to be glamorous. ThinkSTEAM: I see you are the co-founder of a project called Piper. Can you tell us about Piper? Shree Bose: I think one of the best pieces of advice I can give to anyone, but especially to girls who are interested in STEM research, is to never be afraid to reach out for help. I started research and science because I was excited and because I used that enthusiasm to reach out to professors in my area to get started. If you’re interested in anything from robotics to biology, share that enthusiasm. Tell your professors and your teachers, and pursue independent projects. That’s the way to create things that have never existed before and push progress forward. And then once you’ve become incredible successes, like I have no doubt you will be, be sure to mentor other girls to do the same. 🙂 Let’s start a movement.